Families enjoyed spotting wildlife at an Easter holiday rumble in the jungle in Aylesbury on April 10. A pair of giant black and white cuddly pandas came out to play and performed three natural history shows at the event. The pandas were created by street theatre company Los Kaos. Visitors and families met SingSing, a baby panda carried into the performance area by zoologist Bernadette who then narrated the show. SingSing’s mother ChiChi left her bamboo hut to meet the crowds. Afterwards, there was mischief from Creature Feature’s mountain gorillas. The naturalistic apes were accompanied by their intrepid explorer friend who kept the mischievous duo in check. Youngsters were able to learn about their lifestyle and habits whilst getting close for a gorilla cuddle. There were also walkabouts from a pair of charming elephants, Hessi and her younger sister Kalli - the two giant puppets proved a big hit with shoppers of all ages. More Easter fun is coming up at Friars Square on Wednesday April 17 from 11am to 3pm as the shopping centre hosts an Easter extravaganza. 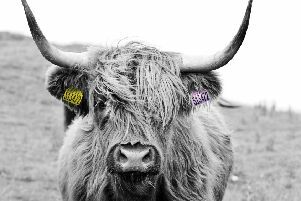 Families can meet Highland Hettie, a magnificent cow, and her good friend Mr Tatterswich the badger. Accompanied by Giles the farmer, the trio are the latest additions to Creature Encounter’s family of magical life-sized interactive puppets. There will be three children’s comedy shows from Bread and Butter’s Ged and Pete Moss so audiences can expect lots of fun, tricks and Easter eggs. Plus there will be a special Easter themed craft workshop to make chicks, bunnies and egg baskets while a pair of Easter bunnies will be jumping around too.